In 2016, Fairfax Media began a wide-ranging digital transformation of its news organization, which included streamlining image management and delivery workflow. An efficient publishing workflow is key for journalists at Fairfax Media, who are responsible for posting articles, including supporting assets, such as imagery. Historically, a lot of production time was spent manipulating images to ensure they are optimized for different target devices and formats for the audience. This process was frustrating because it took valuable time from their core reporting, writing and editing duties. Before Cloudinary, editors had to edit and crop images using an outdated image manipulation tool, which was a time-consuming part of their daily tasks.The Cloudinary API enabled dynamic URL-based manipulations to original high-quality images, eliminating the need for the editorial team to create and store multiple variants of every image and, streamlining the publishing workflow. One of the most useful Cloudinary features for Fairfax Media is automatic, content-aware cropping, which ensures that the point of interest is consistently maintained regardless of viewport or layout of the viewing device. In addition, Cloudinary’s capabilities for supporting responsive images ensures that they are displayed appropriately across all devices and screens with minimal effort. This feature yields crucial performance improvements by delivering the optimal version of the image based on the content and viewing context. Fairfax Media also relies on Cloudinary’s image optimization features, which enable them to deliver browser-specific formats and adjust the perceptual quality to reduce load times without any visual degradation. These features support delivery of images that look good and load fast. “With Cloudinary we achieved better image quality overall, compared to its competitors, with an ideal trade off between quality and file size,” Cronan added. Fairfax Media initially began testing Cloudinary in June 2017, and was immediately impressed with how quickly they could get the solution up and running, then scale to support significant volumes of images. Fairfax Media currently has approximately 3 million images under management with Cloudinary. The Brisbane Times was the first online property to integrate Cloudinary into its WordPress implementation. After a successful pilot deployment there, Cloudinary was deployed for all other Australian metropolitan mastheads over the course of about eight months, concluding in February 2018. 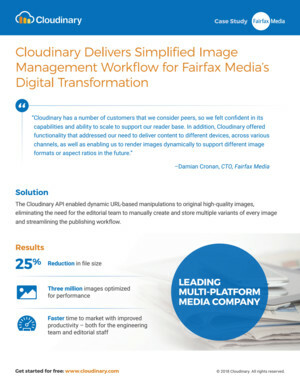 Now as much as 90 percent of Fairfax Media’s network is benefiting from Cloudinary image management capabilities. In early results, Fairfax Media has seen up to a 25 percent reduction in file size. But more important, perhaps, is the improved productivity – both for the engineering team and editorial staff.